OLD GREENWICH, CT - On Sunday, September 2, the Bruce Museum Seaside Center at Greenwich Point Park will host Jim Knox, zoologist and curator of education at Connecticut’s Beardsley Zoo, along with a few live animals from the zoo. At 2:00 pm and again at 2:35 pm, Knox will explore the international state of biodiversity and profile the zoo’s work with Species Survival Plans in Connecticut and beyond. Knox’s message of hope will be underscored by appearances by live animal ambassadors from the zoo including a recovered endangered species and a rescue animal ambassador. In his talk, Knox will invite guests of all ages to “learn how you can help protect our planet's most imperiled and majestic creatures” and explain what concerned local citizens can do to become involved in recovery efforts. 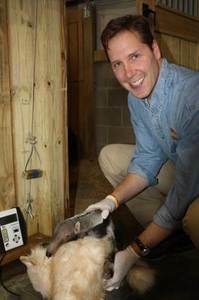 In addition to directing education and wildlife conservation programs at Connecticut’s Beardsley Zoo, Knox is the writer and host of PBS’ WildZoofari, and an on-camera wildlife expert for The Today Show, The CBS Early Show, and Fox News. He studied animal science at Cornell University and has had an impressive career in the field of wildlife conservation. The program, which includes family activities about endangered species from 1:30 to 4:00 pm, is part of the Fred Elser First Sunday Science series held at the Innis Arden Cottage/ Bruce Museum Seaside Center in Greenwich Point Park, Old Greenwich, CT.